(Top L to R) Challengers Nancy Smith, Joyce Ricks and Juan Carrillo top the list for Palmdale School Board. (Bottom L to R) Jim Ledford got more that 60% of the votes for Mayor of Palmdale, while incumbent Tom Lackey and challenger Fred Thompson top the list for city council. 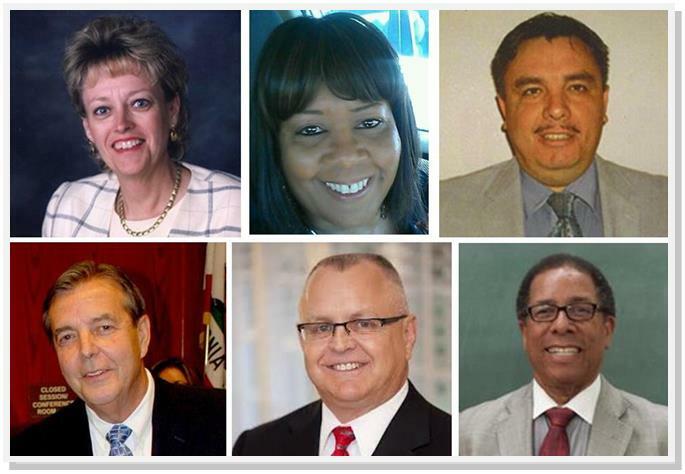 In the contentious Palmdale School Board race, all three incumbents finished behind their challengers. 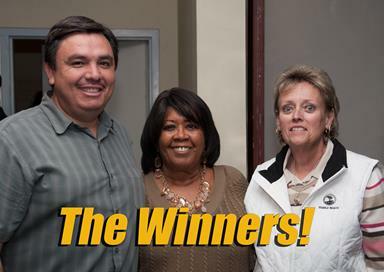 Nancy K. Smith, Juan Carrillo and Joyce Ricks top the list for the Palmdale School Board of Trustees (Just like our poll!). View more results from the Nov. 5 elections, and be sure to share your thoughts! 66 comments for "Election results (Thoughts?)" CSEA has a “me too” for health benefits, nothing more. They were foolish enough to allow their “me too” for wages to be removed from their contract. Actually they don’t even have a current contract as of 10/31/2013. Wake up people and handle your business! The classified is happy with the appointing of Nancy Smith and Juan Carrillo… I’m sure our board will work well with Joyce Ricks… the clasproductive village to raise a child, from the classified, to teachers, community and administrationsified employees worked hard to campaign with Nancy and Juan as well as Don Wilson… we are optimistic and forthcoming that this new board will do what’s needed to improve the relationships between the parents, children and staff to return Palmdale School District to a district that puts out a quality product, from the educated kids, too the best productive staff…. I understand that Hugo has been allowing his teachers to bad month the CSEA board to the classified staff, this is not acceptable. It takes a productive team to finalize the process, each member must respect the other teams laws and regulations. I believe our board is willing to work with Hugo and PETA, but he must learn to respect our way as we respect PETA’s. If the classified, teachers, management and board are going to turn PSD around into a positive light. We need to remember what we are here for, the kids. What do you mean “allowing his teachers”? They are not his teachers and if you are aware of some trash talking then say it. Don’t start more sh@# if you’re just blowing smoke! Welcome to the world of PETA under Hugo Estrada. You really didn’t think that your leadership would get a pass on not doing what they were expected to do right? PETA wanted Ricks endorsed, CSEA wouldn’t do it because they are the ones who knew exactly how incompetent she is.So, CSEA endorsed someone else, and w CSEA leadership is PETA’s next target. The only way he can unseat them is by creating dissent in the schools. It’s a strategy that works well, even when they have to resort to fabrication, it works well. What exactly are the teachers saying. How do you know he is “allowing” them to say anything? Doesn’t CSEA have “me too” clause that depends on teacher contracts? Agree with Quigly. Stop blowing smoke. I would first like to clarify that Chapter 296 is not solely reliant on the “me too” clause. We certainly have not sat back, kicked up our feet to let PETA do all the work for us. It may seem that way to many, but you must remember that our association has very different rules and regulations on how every matter is to be handled with our membership. This goes from voting on the T.A., to voting on which candidates to endorse for board of trustees. The comments our classified unit heard during the process were both positive and negative, but we are not going to linger on personal opinions. The point is that all 3 seats have new members and they key is to work alongside ALL board members to improve the district’s relationship with all employees and the community. Our endeavor is to work together as unions with a common goal, while respecting each others laws of governance. Barbara Gaines victory is huge for the students at the college. A new day has begun. OMG! I have just been reviewing all the PSD post-election comments. I am so glad my deceased husband, Arland Atwood (Scholar/Principal), is no longer around to be tainted by such ugliness. The politics and emotions are forgetting the business at hand: educating the kids. Hey Dam..I am not a parent or emoyee of PSD…just a long time taxpayer who tries to stay informed. How bout you go sit your a@# at the desk of a teacher, any grade, for one week, and do the job with 30 or so students on your own? Then report back to this thread and share with us all how you did! Hmmm, I wonder if you’ll earn your pay for that week or just “kinda”. The election is over, time to stop patting yourselves on the back and go back to “kinda” doing your jobs educating our kids. Please, just try to be a little professional and just stop. Biggest disappointnent of 2014 Election!!! After allowing the Palmdale College Eartquake Property purchase and wasting $5 Million tax payer dollars on it….. $450 sewer property annual property tax bill on his ctizens and Lancasters citizens….million dollar $ corporate give aways…..not fixing commuity blight and sidewalks for school kids….lieing to community about power plant reducing Palmdale citizens electric rates and it being clean. And the disappointment of Mike Adams & Steve Buffalo being re-elected to Antelope College Board for Wasting $5 million on Palmdale Earthquake College property purchase. Well see if they can redeem themselves!!! Along with Palmdale School Districtand AVUHSD for not paying attention to students future for not bring higher education opportunities to Palmdale and south AV. I’ve read A lot of crap in my life but once again this takes the cake. I guess You and Ledford, Adams and Buffalo can pay for students to travel to Lancaster for higher education. Ledford has had 20 +years…..eat that $5 million dollar cake~you must like it! Well, Jason Zink, things didn’t go your way election night so why don’t you call for a shutdown of the government? Oh, wait, Rex already tried that with his lawsuit regarding council elections. Palmdale College is the most important project for Palmdale’s Future…….. why send them to elementry and highschool and not have college where they really learn the most…….so maybe we should to get people to notice good idea!!!! Or the Mayor & College BOARD can admit that they made a mistake and buy another property and move forward! A Cal State university might come to the Antelope Valley. Why don’t you work on that instead of whining. about the Palmdale campus that AV college pulled a fast one on. Congratulations Mayor Ledford. More power to you. Keep up the good work. Welp at least 2 more years of Palmdale being stuck in 2+ decades of Jimbo Limbo. 513,000 resident in the Antelope Valley… Hmm. How many of those live in Palmdale, and were thus eligible to vote in the election? About 150,000. Of that 150,000… how many are of voting age (18)? I’d guess it is about 50%… so 75,000.. Of that 75,000… how many are actually registered to vote..? Etc, ETc.. Yes, the turnout was still pretty pathetic.. but it looks like the real voter turnout for the Palmdale election was closer to 10%. Thank you! And yes, still pathetic..
Great another 4 years of Dumbford! well dumb us for putting him back in office again..so how many more section 8 trash are you going to let move into the city in the next 4 years lems? I heard Rex Parris say that the Antelope Valley needed Section 8 vouchers to occupy all the empty homes. Yes, he did. I never heard Mayor Ledford say that. I’ll tell you what I want to see, I want to see the newly elected Palmdale School District Trustees find the millions of dollars that they say was hidden by the previous administration (like that’s going to happen). You guys in Palmdale put the lunatics in charge of the asylum. How quickly will they back away from that assertion?? Nancy Smith already did find it. It was hidden in plain sight, but the incompetent incumbents didn’t see it, or didn’t want to see it. A Pax Romana is coming to the district. Congrats to all the winners. Can’t even wait to see if she backstrokes publically when she has to admit she lied. After all, this is Nancy Smith we are talking about…hardly a hero to teachers, and definitely in need of a new calculator. Lets see it Nancy. Blows me away that people are re-elected to a board even though schools in their district continue to fail and have poor ratings. Now, I’ve heard that Lynn Minidis was being supported by Lancaster interests. I don’t know for sure but last night on TWC3, she said that because of the litigation, her donors held back. Well, if she was Rex’s proxy candidate, that sure was poetic justice. Anyway, I heard her at the Chamber of Commerce debate and she couldn’t have been more unimpressive. How does someone as incompetent as Joyce Ricks get elected? Palmdale was lied to. Clearly and overwhelmingly voters found her more thrustful, sincere, and competent than not one, not two, but three incumbents. “You can fool all the people some of the time, and some of the people all the time, but you cannot fool all the people all the time.” – Abrahah Lincoln. Their time was up. Time for Mrs. Ricks to change some people’s perception of her, but is her call. No…clearly the union did a very good job of lying to the public, standing on corners advocating for three very incompetent candidates, and illegally eletioneering in the schools, using our childre, and my own daughter to garner adult votes. But, my guess is all we have to do now is watch the show the you union clowns started, as it will unravel, unwind, and hurt kids. And then you will tell more lies and make more excuses, and the ignorant will march right next to you. Not a very good job but an excellent job of informing the community. You are entitled to have your opinion of events Sir. However I do not know you and even if I did I would not insult you nor would I be condescending to you. I rather have a conversation about what affects students and education with teachers and parents, the people you saw in streets. La verdad libera. Now that we have a NEW PALMDALE SCHOOL BOARD MEMBERS, the next thing on their agenda is OUSTING ROGER GALLIZZI from the Palmdale School District, he is a disgrace to this community. I never thought he would return anyways, and now with a new Board elected, members of which DO NOT get along with Mr. Gallizzi.. He will not return. He’ll max out his recently increased “sick day” allotment, then submit his letter of resignation. Pam, if you think you witnessed illegal behavior at the polls, please call the registrar! They would be best able to deal with the situation or help you better understand what you saw. Posting comments like that without basis only makes people even less likely to vote when there could be a very logical and legal explanation for what you witnessed, such as the electronic reader not working so your ballot was placed directly into the ballot box. DD81. Thank you for the advice. While It is so important not to scare away voters into apathy it is also important that voters be made aware when something does not seem quite right at the voting polls. We need to keep each other informed and on top of our rights as voters at these polls. We all to often feel powerless once we cast that ballet. The feeling that our vote may NOT be counted ALSO scares people into an apethetic state of citizenship. You are absolutely correct about informing the registrars office though so I will take your advice constructively. ; ) Long time voter. Pam, I hope the registrar’s office will be able to help settle this issue for you. I agree voters should be on the look out for anything that might be fishy. They also have the right to ask questions at the polling place if they see something they do not understand, and all are welcome and encouraged to watch every step of the process, from opening and closing the polls to the live cams at Norwalk that show how the ballots are handled and counted. Even provisional and vote by mail voters (of which I am usually one, seeing as I spend 15 hours volunteering on Election Day) can get assurance that their vote was counted by calling the registrar’s office after the official canvas. Please keep voting and encouraging others to do so; as you can see, turnout was pretty low, even for those local offices that affect everyone. I don’t see how Jim Lott did not get re-elected to the AVUHSD board. He has been on the board already for 12 years and I have not heard any negatives about him. This is an upset! I agree. I like Lott too. I’ve known him since he was a principal at Almondale. I totally agree! Mr. Lott was one of a few if any, who supported the kid’s by attending their sporting events. He has also been a support to my churches mentoring program, and had dedicated his time to speaking with our church youth about the importance of an educations…I’m outraged about his support from the community. Thankfully Palmdale remains Free of Rex and his minions, for the most part. Maybe now he will worry about his own city and all it’s challenges. Wishful thinking. Clearly you have not seen Nancy Smith’s win. Shocked — I did say for the most part. I wish as well, but insanity is doing the same thing over and over and expecting different results. So, I suspect Rex will try to do the same things over and over again. Agreed! At least Palmdale City will remain in the hands of the people for at least a couple more years and away from the hands of Parris’ ‘good ol’ boys’ from the north. OMG!!! Sandy Corales is on the front page of this morning’s paper smiling and indulging in her early evening lead. I could not possibly be more embarrassed for Sandy Corales right now! How does one rebound from this?? Hopefully she never rebounds. She should never hold a public office again for what has happened to Palmdale School District. That’s future Ledford-appointed, Thompson-replacing COMMISSIONER Corrales, you mean. We will take a future Ledford-appointed individual over ANY Rex backed minion any day. That “Ledford-appointed” individual knowingly and intentionally falsified documentation to the public and the an independent fact finder. So that person lied not only to the community, but to the teachers, the local union and the state teachers union. But you would rather have that person involved in the Palmdale government than someone who you believe is the equivalent of the boogie man.. If the fear of the unknown is worse than being knowingly deceived then maybe you aren’t qualified to be voting for anything more than American Idle..
Oh drop the “evil Lancaster boogeyman” schtick. Ledford played that “evil Lancaster” card against Lackey back during his first run…now Ledford and Lackey are political buds. “Lancaster backed” to Ledfordites simply means “not Ledford endorsed”. It’s a long, dark night waiting for Lying Ledford to sunset. Gary S – who called Lancaster evil? Lancasters mayor is a meddler who needs to mind his own business. What other mayor sues his or her neighboring city every chance he gets or sues for a voting system that he or she does not have or gets involved in their elections or holds press conferences in front of court houses and demands sharing sales tax sharing or calls their neighboring mayor silly names names or tries to stop approved projects or butts in about fireworks? Lancasters mayor should worry about Lancaster. There is plenty to keep him busy for a long time. The people of Palmdale do not want or need Lancasters mayor for anything. Ever. Thank you, Palmdalian, for summing it up so well. There’s a lot of material there and probably more stuff that we don’t know about. Most Rex supporters defend each issue as a unique situation but fail to see the entire pattern in context. Yep Parris is a meddler. And I don’t like that either. But give me a break. Ledford has been playing the “Lancaster boogyman” card for much longer than even Parris has been in office. It’s Ledford’s go-to play. And it’s lame and small. He makes a mockery of his own “get along” moderate image. @Gary S So, Mayor Ledford allows fireworks in Palmdale to make Parris the boogyman. Mayor Ledford supports the building of a power plant to make Parris the boogyman. Mayor Ledford supports at-large council member elections to make Parris the boogyman. Don’t you have it backward, Gary? Parris is the attack dog and when Mayor Ledford responds, you make Mayor Ledford wrong. What conflict with Parris has Mayor Ledford initiated? What quarrel did HE start? What interference did HE cause in Lancaster’s business? Wow, that’s a lot of ugliness you’re carrying around with you. You can tell how classy people are when they even act badly when they win. Stay classy PETA folks. Hopefully it doesn’t scare people to much that people this ugly are teaching small children. She will probably be hanging around Steve Fox more looking for a job or political spotlight. I voted for LSD board and watched a poll worker put my form in a seperate box. I’m not making any accusations but in a town known for some pretty questionable election dealings and incumbent cronyism, It did cause me to raise an eyebrow. A total repudiation of the toxic governance of the current PSD board. The people have spoken loud and clear!!! New board – New vision. Hoping that Joyce Ricks works and protects the PSD Classified employees. They are not the LITTLE PEOPLE as she puts it, and they are very essential on the day to day events in the school district. Guess what Luisa!! Now that you no longer have a diverse board, and your PETA member friends have a super majority, they can go back to the bargaining table, remove their benefits cap, and pass all of that cost on to us “little people” just like they have for years. Get ready for reduced hours, no night custodians, etc., something will have to give for the entitled to get what they want.